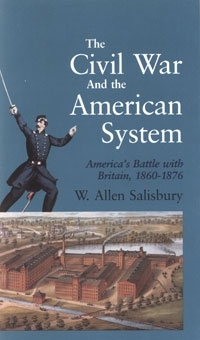 When historian W. Allen Salisbury first wrote this book in 1978, he was seeking to teach Americans that the battle between the American System of economics and the British System of free trade which resulted in the Civil War, was the center of the political battles of the 20th Century. Today this is even more true. The heirs of Adam Smith and the British Empire are pressing for worldwide adoption of free trade, a system which led to slavery in the 19th Century, and would do so again today. And certain U.S. political circles are even openly demanding a return to the principles and Constitution of the Confederacy. Utilizing a rich selection of primary-source documents, Salisbury reintroduces the forgotten men of the Civil War-era battle for the American System: Mathew Carey, his son and successor Henry Carey, William Kelley, William Elder, and Stephen Colwell. Together with Abraham Lincoln, they demanded industrial-technological progress, against the ideological subversion of British "free trade" economists and the British-dominated Confederacy. Salisbury highlights the career of Henry C. Carey, who, as Lincoln's leading economic adviser, acted to prevent a complete City of London bankers' takeover of the United States political-economic system.